Now that I’m nearing the end of the trial’s “maintenance phase,” I’ve turned my attention to understanding the “extended maintenance phase.” It looks like I’ll have to travel to Birmingham once a month for the next two years. I’ll also begin taking temozolomide (a chemotherapy drug) again — at twice the dosage as before. I’m conflicted about getting on chemo again. It’s known to decrease blood cells and other possible side effects. Doubling the dose and taking it for another year could hurt me more than it helps. There’s no way of knowing if it’s really helping. The more research and reading2 I do, the more complicated decision-making becomes. I may continue this line of thought later. Writing out my thoughts helps me weed through my options. I’ve begun taking a supplement — yellow root. Berberine is the major alkaloid in yellow root and there are lots of studies that say it is beneficial for fighting my cancer. More on this topic later. The photo on this post is of me as the human porcupine, compliments of Lisa White, my acupuncturist. Bruce, Diane and David for transport to and from the airport. Carol for the corporate apartment connection. Love, Medicine & Miracles, Dr. Bernie Siegel — a surgeon’s experience and perspectives on the importance of love and mind-set to the recovery process. Also the importance of having the right doctor. Click here to jump down to the medical update (if you prefer to get down to business and skip the personal thoughts in red). It’s good news. But as I sit here suffering from the usual post-vaccination chills and fever while self-medicating on miso soup and green tea, I am compelled to share a personal thought. I am glad that I am the one who was stricken with this cancer, rather than my wife, Tina. The reason? I confess that it’s more than the altruistic and romantic sentiments expected between spouses. It’s equally rooted in selfishness. Selfish, because I want to spend a long, healthy life with Tina. And Tina is the one in this relationship with the tenacity, passion, gumption, endurance and fight that it takes to navigate the hurdles that one encounters in these life struggles. Sure, I would do everything in my power to support Tina if the tables were turned, but truth be told, she is the more powerful one. Her propensity for compassion and talent for getting things done are innate. Doctors, healers, family, friends, neighbors and peers are of invaluable importance to my healing. But I credit her with saving me. This morning I had an MRI — the first one since my craniotomy. Dr. Aiken reviewed the images and declared them “unremarkable.” Not the most vibrant nomenclature, but nonetheless, the news we hoped to hear. To clarify, there is no detectable tumor growth. While this news is celebration-worthy, it’s a small victory. Doctors didn’t really expect to see any growth yet anyway. We have a long, ongoing regimen of medication, monitoring, treatments, research, discipline, planning and doctors’ visits ahead of us. Tomorrow we take the MRI images to Emory to be reviewed by my oncologist and radiologist for second and third opinions. Keep you posted if anything interesting comes of it. 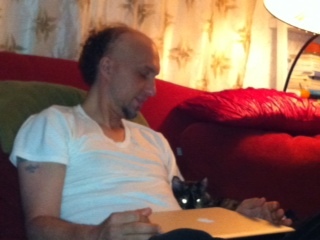 Mila shows she is glad we're home by snuggling up to me. Our other cat, Pickles, couldn't care less. More travel troubles at the airport again, but we eventually made it there. My appointment with the doctor went smoothly this time though. My vaccine was ready and waiting. I passed my neurological exams again without any missteps. This time the injections went into my right armpit. And just like last time, about six hours after the injection, flu-like symptoms set in — chills, slight fever and aching. At least this time I was in the comfort of my own home, rather than on a plane. After a long sleep I was back to feeling fine. After three months of pursuing Social Security disability benefits, I have been approved. This is good news because the only work I am capable of focusing on right now is survival. From what I hear, it’s amazing to be approved for SSI benefits in such a short time. Most applications are denied and the appeal process could require lawyers and take over a year. There is a list of conditions/diseases that the government has approved for expedited review. My cancer, GBM, is one of them — which could be considered the bad news. That is, the government’s willingness to approve my application so “quickly,” validates that my condition is… critical. Nevertheless, I remain optimistic. And I know that all my supporters do too. 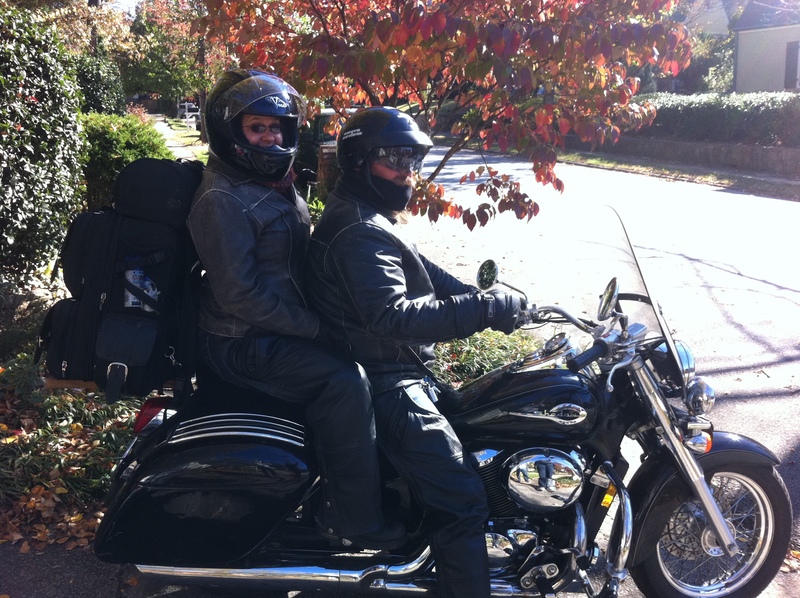 My sister and brother-in-law (Sharon and Albert) visit us via motorcycle on a beautiful Fall day. Sunday, November 20th, we go back for my third injection. But more importantly, I’ll have my first MRI since the surgery. I’m curious to learn what’s physically happening inside my skull. Options include: no change, tumor recurrence or necrosis (death of healthy cells, possibly from radiation). No (detectible) change is, I guess, the best I can hope for right now. We are still waiting to hear if my case will be transferred from Chicago to Birmingham. Beginning in December, my injections go from weekly to monthly but they are to continue indefinitely. Traveling to Chicago is inconvenient. It’s stressful to us physically and mentally. It puts a strain on Tina’s career. And, it ain’t cheap. Going to Birmingham (UAB) for treatment will be more affordable and will allow me to impose on (I mean visit) friends and family. * A note regarding our travel accommodations. Chicago is expensive. We’re lucky to have occasional use of a corporate condo for free. But when we have to foot the bill, we use JetSetter to get good deals on hotels. It’s a free-membership travel deal site. If you’re interested in signing up, using this link (http://www.jetsetter.com/invite/tinamaudsley) will give us credit if you book a stay via JetSetter. We used the site in April, 2011 to get a great deal in Ixtapa, Mexico to celebrate our 15 year wedding anniversary (See photos, if interested). Sorry to sound like a pitch here, but I was an internet marketer before all this. Lisa always “consults” my body to determine what needs to be done. I hold a finger and thumb together. She does something which seems to be like asking my body a question or she’ll touch a part of my body. She then attempts to pull my fingers apart. Regardless of the effort I exert to keep them together, they sometimes release. Other times they hold fast. Something that is really strange, and I may have mentioned in an earlier post, is that she can swipe her hand in one direction on the part of my body she is addressing and my fingers release. Then swipe in the other and they hold fast. It’s as if she asks a question and gets an answer, then asks the contra positive to verify the answer. Just this bit is intriguing to me. At my last appointment with Lisa, we decided to do some energy work. With my eyes closed, I focused on my breathing. I tried to be observant of what I was feeling and experiencing. Lisa did her thing — touching here and there and whatever else (I wasn’t watching). I’m sure I’m not describing the goal accurately, but essentially it was for her to “look” inside me and help de-knot my chakras and contribute to my healing. Maybe you know what it’s like when your eyes are closed and you sometime see shapes or colors. I was experiencing a lot of the color purple. I sort of skeptically, but open-mindedly watched shapes in my mind’s eye morph as if they were relevant. There was no verbal communication between the two of us. Maybe 30 minutes into it, she placed fingers on my forehead and abdomen. At that moment I experienced a flood of orange and white light in my mind and she said, “that’s better.” That coincidence seemed weird (in a good way). After that, I sort of lost track of time. I don’t remember consciously having to focus on what was happening or my breathing. I suppose I was in a bit of a dreamlike state or maybe even asleep. Lisa suggested that I was possibly “out-of-body.” I do remember “waking up” abruptly, like I somehow knew we were finished without being told. Afterwards, I described the orange light to her. She explained that at that same moment, when she said, “that’s better,” it was because she could sense the adjustment (to my energy flow). These are things that I think most people have to experience to believe. I’m not even sure I can believe my own experiences. That is, maybe my interpretations or memories are distorted by what I think should be happening or what I want to happen. But, it feels right. It feels good. I think continuing to explore these things will help me understand better. I do know that it’s not hurting anything. I’d love to hear your opinions and feedback on any of this. Comment below if you want it public. Or privately email me at kenmaudsley@gmail.com. On Tuesday, November 8, I received my first injection of either my custom-made vaccine or placebo for the ICT-107 clinical trial. Several hours after the shots, I experienced flu-like symptoms, which went away after a good night’s sleep. So far, so good. That is the crux of this update. Gratuitous details below. My scheduled appointment was for 9:00 am. As the nurse approached, the look on her face told us something was wrong. The lab did not ship my vaccine. We would have to stay in Chicago an extra day to wait for it. The repercussions of this include extra expenses, Tina’s job responsibilities, rescheduling other commitments… not an acceptable scenario. Tina took the bull by the horns and set in motion a plan to have the vaccine delivery expedited so that it would arrive (from Philadelphia) that day with time for us to make a flight back to Atlanta that evening. Because the lab made the mistake, all our expenses would be paid by the trial sponsor. Unfortunately, the only seats available for the flight home were in first class. What can you do? The flight from Chicago to Atlanta was delayed about two hours. This was just enough time for symptoms of the vaccine to hit me as we boarded the plane. The four blankets I was buried under did little to quell my chills. I had to pass up the perks of first class, but at least I had room to toss and turn. We are choosing to view these symptoms as a sign that I got the real vaccine as opposed to placebo. I expect the lab might design the placebo to have similar effects though. I began the day with a visit to my acupuncturist. We decided to do some energy work to help harmonize and align my chakras. (Or something like that — this is all new to me.) It was amazing. I’m experiencing things that I once would not have believed. I think I made a good decision adding this to my treatment regimen. Then we flew to Chicago to begin the ICT-107 clinical trial. A four hour flight delay prevented us from getting there early enough to enjoy the evening, but at least we made it. We had an early morning appointment at Rush. This visit involved taking a lot of blood for various tests to ensure that I still qualify to participate. If so, I’ll travel to Chicago weekly this month for vaccine injections. The first MRI will be on November 21. This will be the first check to see how things are going since my surgery. Doctors do not expect to see any tumor regrowth this early. I feel good about participating in this study but I occasionally get angry about being in this situation. As we were leaving the hospital, I shared an elevator with a woman with no legs. She maneuvered her wheelchair with agility using prosthetic hands on arms that ended below the elbow (and did it with a smile). It was an attitude adjustment for me. Although my condition is still considered terminal, I realized that many, many people suffer worse and endure more than I. We flew back to Atlanta. We met with the oncology team at Emory today. At the end of November, I will begin taking a double dose of chemo five days a month for the next 12 months. We then attended a brain tumor support group. Today there were about six other people with stage 4 GBMs. We learned that the Southeast has a higher number of brain tumors than other parts of the country. The National Cancer Institute is doing an epidemiological study to determine if diet, exercise or genetics play a role. I qualify for the study and am a prime candidate because I have a brother who does not have brain cancer. They would want him to participate too. Basically, you confidentially answer a bunch of lifestyle questions and send in some toenail clippings and saliva. I have to admit that I’ve never been extremely philanthropic, but this seems like a responsibility.